Floods: How they affect your new driveway! As seen in the news, thousands of people in England are being faced with floods. These floods are so severe that residents have had to be evacuated from their homes. 75 flood warnings are still in place. Over development of cities and loss of garden area. Increased home developments that have efficient drains. They’re leading the rainwater into river systems too quickly. These factors have led to river levels rising too fast. Which is causing localised flooding. Regulations have been introduced to reduce the severe flooding. 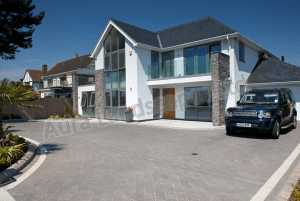 We have looked into how these regulations will affect you and your dream driveway. SuDs (Sustainable Urban Drainage systems) are a way of managing rainwater falling on roofs and other surfaces. Their main purpose is to reduce the risk of flooding and water pollution. There is now legislation and regulations surrounding SuDs, but many home owners are unaware of the legislation. Firstly, check the regulations of your Local Planning Authority. They may have set local requirements that are stricter than those in the National Standards. Any rain falling on your property must drain into the ground within the property boundary. This means the surface must be permeable. Although, if you want to use a traditional impermeable surface, then it must be constructed so the water is kept in the property grounds. Is it your responsibility to comply with the regulations? It’s the responsibility of the home-owner to comply, not the company you hire. Make sure when you are extending or replacing your driveway that your contractor fully understands the legislation. Authorities do have the power to remove or undo any work that has been carried out without planning consent. They also can give you a penalty. Make sure your choice is able to cope with the amount of water collected. So when undertaking your dream driveway, check how your chosen company are dealing with drainage. If your chosen landscaper doesn’t talk to you about drainage requirements, question this and seek advice from other landscaping companies. We wish a quick recovery to all the people whose properties and businesses have suffered the floods over the last week.